Whoo, boy. I don’t know how it is where you live, but here in Central Ohio flu season has hit with a vengeance: even those who got the flu shot are catching odd strains and holing up on the couch for days. And those of us lucky enough to avoid the flu (*knock on wood*) are still wandering around with miscellaneous coughs and sniffles. It’s definitely time for magical ginger tea. So what is it? 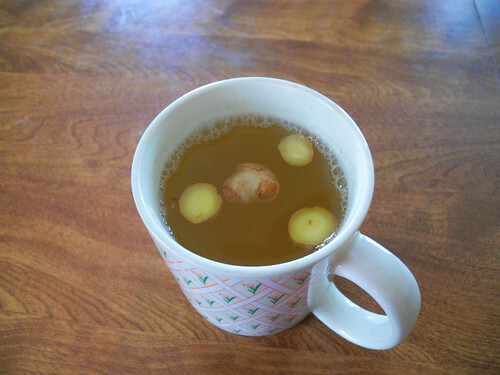 Ginger, honey, and lemon. I’m giving you my preferred proportions, but they’re more like guidelines: there are innumerable variations of this recipe out there, all slightly different. Over the years I’ve become increasingly impatient while sick, so my methods have become more and more streamlined. 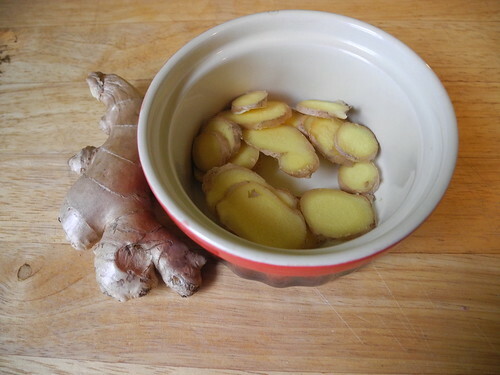 I used to peel the ginger; now I don’t bother, because ginger peel’s perfectly edible and ginger is annoying to peel. I used to use fresh lemons and drop the squeezed halves in the brew; now, if we’re being totally honest, I just grab the bottle of lemon juice from the fridge because I can hardly insist on fresh citrus when I can’t even be bothered to put on real pants. And yet, it still works wonders. Ok, that’s a little over-the-top: it’s just a simple little recipe, after all. 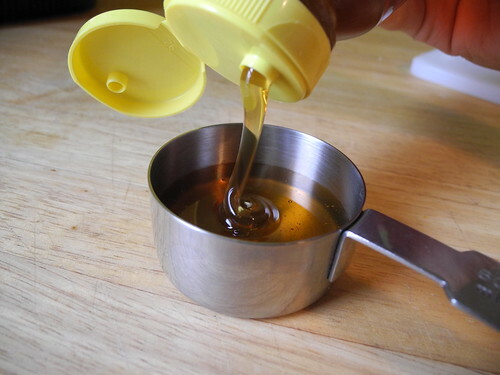 But all the ingredients are traditional folk remedies for throat ailments, so there’s definitely something to it. Even if you’re feeling perfectly hale, give it a whirl: it’s delicious, and a little bit of preventive medicine goes a long way. Bring water to a boil, either in a kettle or in a saucepan. 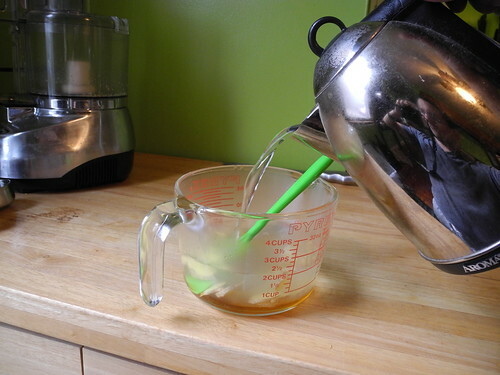 If using a kettle: pour the boiling water over the lemon, ginger, and honey in a heatproof container and stir to combine. 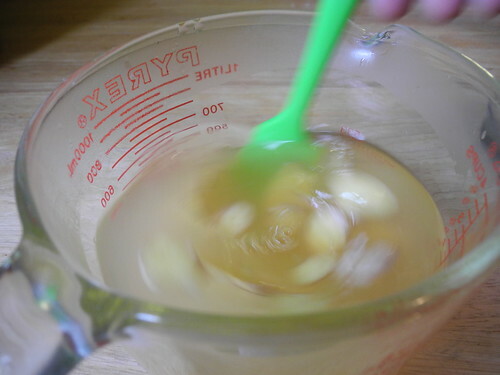 If using a saucepan: remove from heat and add ginger, lemon juice, and honey; stir to dissolve. Let steep 15 minutes, then drink warm, or chill and serve iced. Could you add whiskey to this? Why yes, you could. It’d even be a fairly traditional home remedy. About 1 oz. (2 Tbsp) per mug should be right. If you happen to be a huge nerd like me — and therefore you have a soda siphon at home — I can attest that this mixture, well-chilled, fizzes up nicely. I have been drinking two pots a day since I got sick the day after you posted this (perfect timing!) So soothing. I’m sorry you’ve been sick, but I’m glad this has helped! Feel better, and enjoy. Would you mind if I distributed this recipe at the Near East Side Co-op? Our weekly garden bag has fresh ginger, and we like to distribute great recipes matched with the bag’s ingredients.